Legends and interesting anecdotes give a rich halo to over 2,000 temples dotting the landscape of Himachal Pradesh. Apart from being pilgrimage centres, the temples are the focal point of all religious events and celebration on major occasions in the hill state. Moreover, every temple has its own tale sourced from the legends and mythological history on how it came into existence in the first place. Large congregations at the temples during religious occasions like Shivratri, Diwali and Navarathri further strengthen the community bond in the locality. One of the most famous temples in Himachal Pradesh. It is one of the Shakti Peeths of India. The temple is situated in Bilaspur district in Himachal Pradesh. According to legend, Goddess Sati burnt herself alive to avenge an insult to her husband Lord Shiva. But Shiva gripped with fury and grief, picked up the body of Sati and started his gyrating dance known as 'Tandava' dance in the puranas. To stop the horrifying dance by Lord Shiva and to save the universe from his wrath, Lord Vishnu decided to intervene. Lord Vishnu's chakra cut the corpse of Sati into 51 pieces. Thus wherever the pieces of Sati's body fell on Earth is known as a Peeth. There are 51 Peeths on earth. And these Peeths are considered to be very sacred and worth visiting for the Hindu pilgrims. It is believed that Sati's eye fell at the very place where the Naina Devi is built. The word Naina is associated with the eye of the Sati. The Govind Sagar lake and Bharka dam is situated near this temple. According to legend, the tongue of Sati fell in the place where thetemple is being erected. The temple is built in homage to goddess Jawalmukhi, also known as Maa Jwala Ji. The meaning of 'Jawalmukhi' is mouth of flames and 'Jwala Ji' means flames. 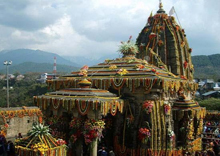 The temple is situated at a distance of 34 km from the Kangra Valley. The temple of Mata Chintpurni is dedicated to Mata Chintpurni and Chhinnamastika Devi. It is located in Una district. The deity has derived such a name from the idol of goddess Durga in the temple, which is without a head. It is believed that the feet of Sati's corpse fell on this place where the temple has been built. The temple of Chamunda Devi is 8 km from Dharamshala. According to mythology, the trunk of Sati's corpse had fallen in this place. According to another belief, the goddess beheaded Chand and Munda, two demons. The other name for Chamunda Devi is Mahakali. Thus the temples of Mata Chintpurni and Chamunda Devi are considered as the Shakti Peeths. 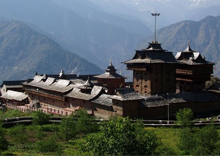 This holy pilgrimage site is located in the Bias valley of Himachal Pradesh. It is a temple dedicated to 'Siva Vaidyanatha' meaning the 'Lord of the physicians'. The architecture is remarkable for its intricacies and chisel works. Situated in the Chamba district, there are 6 temples in this huge complex dedicated to both Lord Shiva and Lord Vishnu. These 6 temples are neatly structured from north to south direction. Laxmi Narayan temple complex was built in the 10th century. The Shikhara style of architecture is quite evident from the imposing facade of the temples. The rulers of Chamba took adequate care to maintain this religious complex. It is believed that Raja Sahil Verma built the Laxmi Narayan temple. It is situated in Deothsidh district. Both tourists as well as the followers of Baba Balak Nath visit this temple throughout the year. 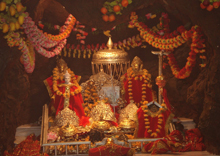 Baba Balak Nath temple is inside a cave in Himachal Pradesh. The cave is in Dhaulagiri Hills situated in the Hamirpur. Since the powers of Baba Balak Nath are known among his followers, the temple has become a crucial centre of pilgrimage. 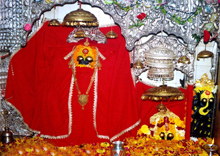 Baba Balak Nath temple is situated at a distance of 70 km from Bilaspur and 30 km from Hamirpur. The temple is in the Kullu valley. The altitude at which the temple is situated is about 2,438 metres amid a beautiful landscape. From this temple, the magnificent scenery of the valleys of Kullu and Parvati offers a breath-taking view. Perched atop Mathan hill, 11 km from Kullu, the temple offers a commanding view of the valley. The temple is built in 'khash' style. A 20 metre high wooden pole stands are installed for seeking blessings from the sky in the form of lighting which breaks the main deity Shiva Linga. The priest then rebuilds the Shiva Linga. A special ceremony is performed in this process. The Shiva devotees carry a chariot of Bijli Mahadev where the deity is taken out. The followers invoke his blessing for bringing rain, good crop, and help in worldly affairs or birth of a son. 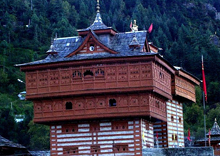 Situated in Dhoongri, a village in Manali district, Hadimba temple is associated with the Mahabharata. Due to its location, the temple of Hadimba is also known as the Dhoongri temple. The Hadimba temple is built to pay homage to Devi Hadimba, wife of second Pandava prince Bhim. Maharaja Bahadur Singh built the Hadimba temple in 1533 CE. The temple has a four-tiered pagoda roof and a beautifully carved wooden door. In May every year, a fair is arranged in the temple of Hadimba. Another fair is held during Dussehra. Renuka Lake around the temple in Sirmour district is regarded as the embodiment of Renukaji, the wife of the sage Jamadagini and the mother of Parshurama. Parshuram is one of the ten avatars of Lord Vishnu. Shaped like the profile of a woman, the lake has the circumference of 2.5 km and is the largest in Himachal. Boating and trekking are additional attractions of Renukaji, whose natural beauty attracts thousands of people throughout the year. The ancient temple is at a distance of 3 km from the chief market place in old Manali. According to Hindu mythology, Manu sage is the divine creator of mankind. It was in this region that the sage lived and meditated. Manali sits along the Manalsu River that flows into the River Beas. The village is named after the sage who is believed to have lived in this region. The village of Manali houses the Manu temple that witnesses a steady stream of devotees and tourists alike. Located on the Kullu-Manali stretch. A Durga idol in a cave offers darshan to pilgrims. A saint built this cave temple in 1964. After his death, this temple is managed by Sharda Sewa Sangh. There is a Lord Shiva temple near the cave shrine. The management runs a free 'lunger' and 'saraye' for night stay on the temple premises. The chief deity of Kullu is Raghunath Ji. A grand Dussehra festival is organised here. It is believed that Lord Ram used this idol for the Ashwamegh Yagya and later on it was brought from Tretnath temple in Ayodhya. The temple was built in 1660 CE with a mixed look of Pahari and Pyramidal style. Adjoining a hill 10 km from Kullu, Bhakhali is a small village of Brahmins. But by foot, this village is only 4 km from Kullu. It is the adobe of Jagannathi Mata, also known as Bhuvaneshwari, the sister of Lord Narayana. A fine testimony to local carvings, sculptural works and temple design. Three fairs in April, June and on the first day of Kullu Dussehra held here at Bhakhali. On Dussehra day, gur-khel is worth to seeing. After the sunset the goddess is taken out on a chariot. The place gives a beautiful view at a height of 1,833 metres. It is built by Raja Jagat Singh in the place of two Shiva temples. The temple has a pyramidal style. The idol of Rama was brought from Ayodhya and kept here till 1661 CE, thereafter it was shifted to Kullu. The temple was repaired by Raja Dilip Singh in 1889 CE. Since 1981, a trust is looking after the temple. A free lunger also runs here. 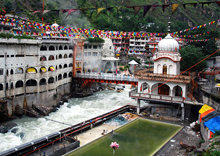 The other holy places at Manikaran are Bhagwati, Krishna, Bairagis and Vishnu (or Raghunath) temples. Saint Narayan Hari came to Kullu in 1940 from his native Kamalpur (Pakistan) and settled in Manikaran. Initially there was nothing except two hot water springs. He worked on the religious shrine (for the Sikhs) and the 50-year of struggle bore fruit in the shape of the present Gurudwara. And now this Gurudwara can accommodate more than 4,000 people with free lunger facility. There is an artificial cave near the Gurudwara built by the saint where he used to meditate for 40 days or so in a year. A 4,000-year-old temple of Guru Vashishtha on the right side of the springs believed to have been constructed by the King Janamjaya. The temple has a black stone statue of Sage Vashishtha clad in dhoti. The village is famous for hot water springs. There are two Vishnu temples at Naggar. One has a small pyramid type shape and is of archaeological importance. The festival 'Ganer' is celebrated with pomp from here. The other Vishnu temple is near the castle on the eastern side, a few steps down from the main road towards the village. The temple has pyramid shape with a slate roof. There is an idol of Lord Vishnu about 4 feet height made of 'Asht-Dhatu' (a mixture of eight metals). The idol stands on the pedestal (Kamalasan) and has Chaturbhuj figure. The pedestal is itself of stone square and about a foot high. Petals of kamal (lotus) have been carved round it.